The DVD and Extras reviews are by Dan Heaton. Apollo 13 chronicles the triumphant efforts of astronauts Jim Lovell (Tom Hanks), Fred Haise (Bill Paxton), and Jack Swigert (Kevin Bacon) to make the journey home and overcome countless nasty obstacles. It also depicts the other side of the events�the engineers and astronauts in Houston who struggled to discover unique methods to save their guys. Gene Kranz (Ed Harris) leads the team at home and tries to keep everyone focused on each individual problem. Wearing their white shirts and glasses, the Houston crew skipped sleep and kept pushing until a solution arose. They faced extremely limited power supplies and consistent new troubles, and the chances of survival were often considered as low as 10 percent. This fictional recreation of their success offers a heart-warming tale of triumph over tremendous adversity. The story begins during the Apollo 11 landing and presents the home life of Jim Lovell and his wife Marilyn (Kathleen Quinlan), who must shoulder considerable worries during his spaceflights. He makes brief appearances at home between the countless training hours, but she must deal with nearly all the daily family issues. When their teenage daughter Barbara (Mary Kate Schellhardt) wants to dress as a hippie on Halloween, Marilyn must be the mean one and reject the idea. Jim's thoughts remain focused on the Moon, and events change considerably when Alan Shepard's ear infection places his crew on Apollo 13. This unlucky number inspires reticence for his wife, but Jim's sights are focused on the ultimate goal�landing and walking on the moon. Image Transfer Review: The HD transfer is nothing short of stunning, with plenty of fine detail, rich colors and deep, deep blacks in space. It's truly sparkling and takes the lead as the best example of this young format's possibilities. The detail inside the spacecraft and in space pulls one even deeper into the action than I'd blieved possible. The beauty of space and the chaos of the disintegrating service module are captured in fine clarity without any issues whatsoever. Audio Transfer Review: English, French and Spanish DD+ tracks are provided, with plenty of range and depth, and excellent bass on the launch and other sequences. The surround mix is highly effective and there's no extraneous noise or hiss. The rumble of the command module as it plunges into the atmosphere is house-rattling. Very nice indeed. Extras Review: None of the extras are presented in HD. 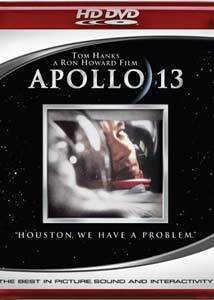 The 1996 hour-long feature Lost Moon: The Triumph of Apollo 13 appeared on the initial release, but it remains an impressive piece. The film provides a detailed overview of the picture from the initial casting to the filming process. Following a significant look at each character and actor, it moves on to the special effects that helped to recreate the astronauts' journey. Especially intriguing is the discussion of the "vomit comet," a high-speed airplane that uses severe dips to simulate the effects of weightlessness. This vehicle actually became the setting for some shots within the aircraft and helps to increase the believability considerably. Jim Lovell and many of the crew members appear to discuss the actual events and compare them to the film product. All seem very proud of their participation in the events and feel strongly about the movie. Several new documentaries also appear on Disc 2 that were not a part of the original DVD release. The most significant entry is the 48-minute documentary Conquering Space, a compelling feature that provides a broad overview of space program's history. Especially interesting are the elements describing Apollo that might not be familiar to younger viewers. The film offers plenty of archival footage and interviews with many key participants. Narrated by Bill Curtis, the material does veer a few times into a public-relations commercial for NASA, but it generally stays focused on being informative. The other new inclusion is a 12-minute featurette entitled Lucky 13: The Astronaut's Story that offers a briefer look at the Apollo 13 history. Much of this material was covered in the Lost Moon documentary and commentaries, but its extra information is always appreciated on this topic. A stunning transfer highlights this second repackaging of the film, this time in HD format. Most of the extras are retained (though the isolated score remains gone, and there's no IMAX variant). But it's one of the most suspenseful films of the 1990s and an epochal moment in the American space program, given vivid life by Ron Howard.